Heads-Up Displays: A Driving Solution or Another Distraction? 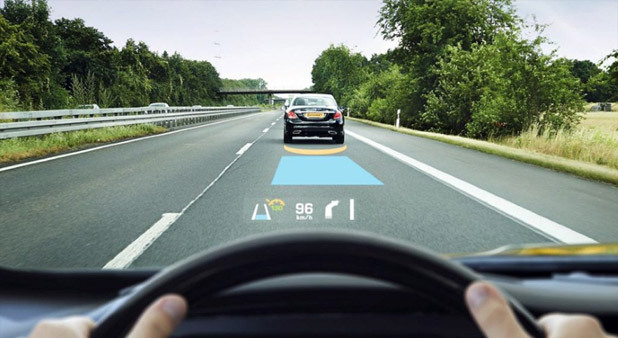 You may have seen recent reports about the “heads-up displays” (HUDs) technology for cars, where information is projected onto the windshield of the car as you drive. The transparent display provides navigational assistance, speed and other dashboard components, lane change alerts, etc. Recently, a startup called Navdy unveiled a link to the auto display and your smartphone information. Other formidable players in this space are Continental and Garmin, among others. Most players have focused to-date on the display of navigational, safety, and instrument information. But it’s clear that with companies such as Navdy, HUD is headed into a more interactive territory. Proponents of HUDs believe they will make our roads safer by keeping drivers from fumbling with their smartphones while driving, or even having to look down at their instrument panel. With the projected image on your windshield, the theory goes, you’re able to keep your eyes on the road. Indeed, on any given day, Distracted.gov estimates over 660,000 vehicles are being driven by someone using a hand-held cell phone. This all too frequently, and often tragically, results in accidents. A second part of the HUD business proposition may be a pragmatic one: people are going to be using their phones anyway, so this is a better alternative. But the question is: is it? Hands-free technology and voice-activation software have equally been touted as benefits for the same reason: users can keep their eyes on the road. Yet, both voice-activation software and hands-free are not panaceas. In the case of VA technology, it still affects the cognitive part of your brain. Many of the simple tasks that come with VA technology increase a driver’s cognitive workload. And, depending on the situation, that can be dangerous. Vehicle voice-activated “infotainment” systems that are more complicated or just take longer to navigate created the highest levels of driver distraction and safety risks, according to a recent AAA study. Hands-free phone technologies also don’t solve the problem of having a conversation, especially an important or emotional one, while driving can be only a little less distracting than juggling a phone. It’s for the same reason: Cognitive distraction. Many studies back this up, including a groundbreaking one from the National Safety Council. It would appear that the same question of cognitive distractions applies to new HUD techs. While we can all appreciate any tools that will make our roads safer— the question is whether turning your windshield into a computer screen is the way to go? For that, we’ll have to wait and see.